NEPPTUNE - A - LOOOOOZAAAAA!!!!! Craig Nepp is turning 50! He survived. (Wow.) We survived. (Wowow.) A celebration is in order! In typical Craig fashion, he is trying to let his birthday pass with no fanfare - to stay out of the limelight. Cuz that's Craig. While we may begrudgingly grant him his birthday wish of no party (grumble grumble grumble) - we are still gonna express our love/appreciation/gratitude (and/or guilt) by pooling our monies together so he can at long last get what's he's been pining over for years: a vintage trailer. Yep. And... maybe a puppy. (Cuz... LOOK AT THAT PUPPY!) At least with these gifts, we can all hope that the reason we haven't seen him out and about is because he's camped in his trailer in Lone Pine with his baby Blue Heeler instead of working 12 jobs at once, helping all of us out. As he does. As he's always done. For half a century. So here's our chance. To thank him for never saying no. For the construction work. For the mixing. For the editing. For the heavy lifting. For the rides.For the friends and family rate. For the "for free" rates. For the laughs. For being Nepp. Help fill his birthday coffer by SHARING this page with the extended Craig Nepp circle via email, text or private message. Let's get the man that trailer. And (what the hell) a puppy. P.S. WE ARE ALSO collecting short video messages from folks to assemble into one montage for Craig. FUNNY, IRREVERENT, OFFENSIVE BIRTHDAY MESSAGES NEEDED! Please send those video messages (and any old, fun photos with/of Craig from days of yore) to davidxmau@mac.com. (You can also leave a public message here on this page.) AND REMEMBER - THIS IS ALL A SURPRISE. SHHHHHH..... (Please don't share publicly on Facebook.) Thanks! NEPPTUNE - A - LOOOOOZAAAAA!!!!! 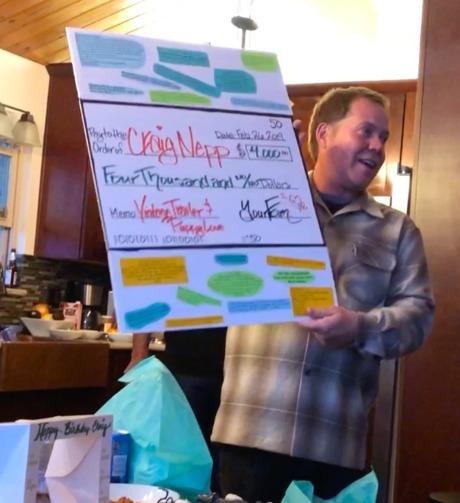 Craig Nepp is turning 50! In typical Craig fashion, he is trying to let his birthday pass with no fanfare - to stay out of the limelight. Cuz that's Craig. While we may begrudgingly grant him his birthday wish of no party (grumble grumble grumble) - we are still gonna express our love/appreciation/gratitude (and/or guilt) by pooling our monies together so he can at long last get what's he's been pining over for years: a vintage trailer. At least with these gifts, we can all hope that the reason we haven't seen him out and about is because he's camped in his trailer in Lone Pine with his baby Blue Heeler instead of working 12 jobs at once, helping all of us out. As he does. As he's always done. For half a century. To thank him for never saying no. For the construction work. For the mixing. For the editing. For the heavy lifting. For the rides.For the friends and family rate. For the "for free" rates. For the laughs. Help fill his birthday coffer by SHARING this page with the extended Craig Nepp circle via email, text or private message. Let's get the man that trailer. And (what the hell) a puppy. P.S. WE ARE ALSO collecting short video messages from folks to assemble into one montage for Craig. FUNNY, IRREVERENT, OFFENSIVE BIRTHDAY MESSAGES NEEDED! Please send those video messages (and any old, fun photos with/of Craig from days of yore) to davidxmau@mac.com. AND REMEMBER - THIS IS ALL A SURPRISE. SHHHHHH..... (Please don't share publicly on Facebook.) Thanks! We did it! On Saturday, at a small gathering, Craig was presented a gift box by his godson, Sterling. In it he found a toy camper and a stuffed puppy. His other godson, Spencer, then handed him an oversized card covered with the messages each of you wrote. The total presented to him, as printed on this "check" from Plumfund was $4000! INCREDIBLE! But it didn't stop there! Before Craig even had a moment to process it all, a number of his friends and family started pulling $100 bills out of their pockets & just kept handing them to him - bringing the grand total for trailer & puppy to $5000!! Craig was absolutely blown away. In fact, he's still processing. He asked me to let you know he'll be reaching out to thank you individually soon, after the shock has worn off. :) To everyone who so generously contributed, via donation and/or word of mouth, know that - together - our affection, gratitude, and love for Craig was truly amplified. THANK-YOU for being a part of the magic. Amazing! Thank you to everyone who has contributed to Craig's surprise gift. At this point, we have enough for a puppy and a solid down payment on a trailer...which is fantastic. THANK YOU. HOWEVER - We are leaving the fund open this week so others have the chance to also contribute. We still have a few days to reach people who love Craig and would want to contribute in any amount. Please share with your circles. (You CAN share this page on Facebook, just be sure to block Craig from seeing the post in the privacy settings.) VERY IMPORTANT: We are NOT revealing this gift fund to Craig until Saturday. So please don't mention this to him this week if you speak to him. Let's keep it a surprise. :) Tuesday, Feb 26 is Craig's birthday and he is not on social media so much anymore. Good ol' fashioned texts or calls are the way to go! Thanks everyone! A Vintage Trailer Nepp Can Fix Up! 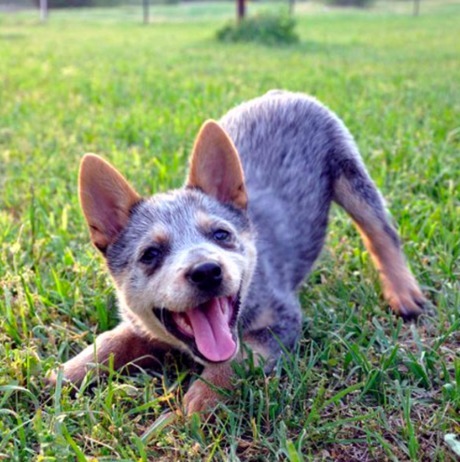 Buy Craig a Blue Heeler Puppy! One for each sweet cheek. Paul Bonaventure6 weeks ago Happy Birthday Craig! Let me know if I could help you soup-up that trailer. Jon Toby Olsen6 weeks ago Happy Girthday!! Misty and Ben6 weeks ago Happy Birthday Craig! Here's a small contribution to your dream of outdoor adventuring; one that we can wholeheartedly relate to! Kim Le7 weeks ago Best wishes. Cody Van + Knox7 weeks ago Thanks for ALL you do Craig. HAPPY BIRTHDAY OLD MAN! Ken & Lori Gallagher7 weeks ago Happy Birthday buddy!! Kathryn White & Eric Nepp7 weeks ago Happy Birthday Craig! Thank You for being such an amazing Human Being...We have been through some pretty crappy things and you have always been there for us and that means so much to have you here, sloshing thru that mud with us...lol....Really Dude, you always come thru and never say 'No' and your kindness restores my faith in humanity...cuz let's face it, this world is sometimes unkind..... We wish we could give you so much more because you deserve it ALL! Happy Birthday to an Amazing Brother!